The author describes her journey from Hollywood to the holy woods. It was at the banks of the River Ganga that the author found her calling. Most people go to India seeking enlightenment, or at least advanced yoga studies. I went because I liked the food. Twenty-two years ago, I had graduated from Stanford and was doing my PhD in psychology, with only my dissertation left. It was time for a travel break. I agreed to go to India, a place I knew nothing about, only because I was a staunch vegetarian, or “veg-terrorist” as my friends used to say. In India at least, I knew I wouldn’t have to grill waiters in languages I didn’t speak about whether there was chicken broth in their vegetable soup or in the water they used to boil rice. I was not religious. 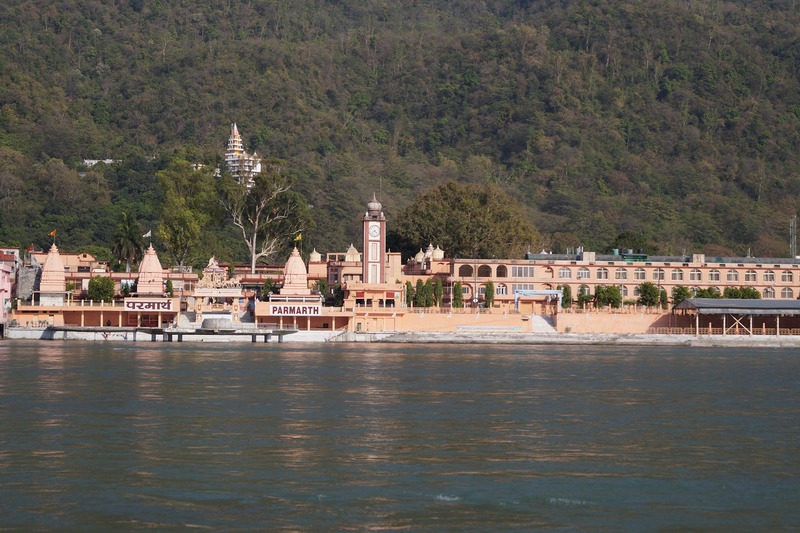 I was not consciously seeking or searching or yearning for God’s grace, and yet 36 months after being one of the only students to ever get an A+ in Dr Phil Zimbardo’s psychology of mind control class, I was sitting on the edge of the sacred Ganga River in Rishikesh, India with tears of ecstasy streaming down my face. The transformation happened suddenly. “I’m going to put my feet in the river,” I had said, after we dropped our bags at the hotel. I was not expecting spiritual awakening, but it happened, before my toes even touched the water. They were not sad tears I was crying of course, but they weren’t happy tears either. They were tears of the truth. Tears of coming home. That which was given to me standing on the banks of Ganga was more real than anything I had experienced in 25 years. It wasn’t even a decision to be made. I was someone who was always deeply committed to truth, and so for me there was no way to go back. Even though it wasn’t the package that I had ever anticipated happiness would come in, or life would come in, there it was in front of me, and there was no way to deny that that was what I had just seen and what I had just been given. I spent the next several days in Rishikesh in meditative bliss. I thought, “OK, this is where I belong.” But where? How? Doing what? My connection with Parmarth Niketan, the ashram where I now live, began simply as the pathway for me to go from the hotel to the river. I was walking through the ashram one day, and I heard a voice say, “You must stay here.” I looked around to see who had spoken. If there was a voice, clearly someone had spoken. There was no one. Now, in my entire sphere of reference and experience, the only people who heard voices were schizophrenic, and of course Joan of Arc. But since I definitely was not Joan of Arc and I really hoped I was not schizophrenic, I did what any self-respecting scientist would do: I ignored the voice. If no one had spoken, I didn’t hear anything. About 30 seconds later, I heard it again: “You must stay here.” I look up and I see a sign that says “Office.” I went in and told them I wanted to stay. That was what you could call the beginning. I’ve spent the last 22 years in Rishikesh, engaged in study of the self and in service to others under the guidance and blessings of my Guru, Pujya Swami Chidanand Saraswatiji. So, what has living in India taught me? First, stay open. The universe has a plan for you. Yes, of course, we have to choose a path and walk it, but we only do that until we get a signal that says, “Turn right now.” Look at the caterpillar. The caterpillar spends most of its life crawling on the ground, and then one day it hears a voice or it gets a signal that says, “Climb the tree.” Then the signal says, “Now go out on the branch, weave yourself into a cocoon, and sometime later, burst forth, jump, and fly away.” It has no idea how to fly! It’s never flown, but when that signal comes that says “jump,” it does. The second lesson is that your Self is much more important than your shelf. Most of us spend a lot of time and energy focussed on filling our shelves with possessions, and we spend very little time thinking about the fullness of our Self, but it is in that fullness that real abundance lies. No matter how much we have, most of us want more. We think, “If I could just have that, or achieve this, then I’d be happy.” But if our happiness is contingent upon something to fill our shelves, then happiness and abundance will always be an arm’s length away. In India, I have found even the poorest of the poor are so eager to share, and they beg you, “Please, please, come home for a meal, come for a cup of tea, come for a cold drink.” Abundance is not building mansions while others live in shacks, or eating caviar while others starve. Abundance is connecting deeply with the fullness of our Self, recognising that our cup runneth over and eagerly sharing with others. Lastly and most importantly, in service to others, I have discovered the fullness of myself. Not service from the perspective of one who has to those who don’t, or a humanitarian serving the masses, but service of Self to Self. If you trip and injure your right leg, your left leg will pick up the extra weight. We call that limping. No one had to say, “Oh great humanitarian left leg, would you mind picking up a little bit of extra weight?” The left leg is not waiting for an award or a gold star. It does it because it understands that the right leg is self. That is the goal of service, to serve myself in you. In serving the children, I found myself. Spiritual awakening does not take us further from the world, it brings us closer. Spiritual awakening does not separate us, it connects us. Spiritual awakening is not about my bliss in the midst of your misery. Spiritual awakening is awakening from the illusion that who we are is based on what we earn, acquire, or achieve. It is an awakening into the reality that each of us is an embodiment of the Divine. It is awakening out of the illusion of our separateness into the reality of our oneness, a reality in which there is no place that I end and you begin. It is awakening from a life that is in pieces into a life of peace. Is It Okay to Lie Occasionally If the Truth Hurts? Sadhvi Bhagawati Saraswatiji, PhD, was raised in an American family in Hollywood, California and graduated from Stanford University. She was completing her PhD when she left America in 1996 to come and live permanently at Parmarth Niketan Ashram in Rishikesh, India. She has been living there for the last 20 years, engaged in spiritual practice and dedicated service. Sadhviji is a renowned speaker who gives keynote addresses at large forums, on a wide variety of topics ranging from conscious business to science and spirituality to sustainable development to the keys of happiness and peace in life to all aspects of yoga.